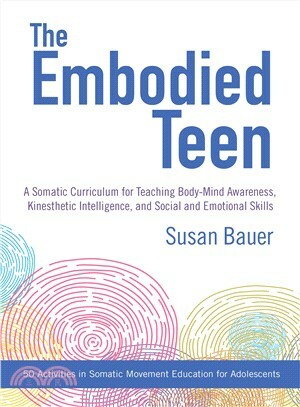 Susan Bauer presents a groundbreaking curriculum for teaching teens how to integrate body and mind, enhance kinesthetic intelligence, and develop the inner resilience they need to thrive, now and into adulthood. Designed for educators, therapists, counselors, and movement practitioners, The Embodied Teen presents a pioneering introductory, student-centered program in somatic movement education. Using the student's own body as the lab through which to learn self-care, injury prevention, body awareness, and emotional resilience, Bauer teaches basic embodiment practices that establish the foundation for further skill development in sports, dance, and leisure activities. Students learn the basics of anatomy and physiology, and unlearn self-defeating habits that impact body image and self-esteem. By examining their cultural perceptions, they discover their body prejudices, helping them to both respect diversity and gain compassion for themselves and others. Concise and accessible, the lessons presented in this book will empower teens as they navigate the volatile physical and emotional challenges they face during this vibrant, powerful stage of life. SUSAN BAUER (MFA, RSME/T) is a teacher, dancer, writer, Fulbright Scholar, and somatic educator and practitioner. In her thirty-year career she has taught in middle school and high school, college, and community contexts, and has led teacher trainings and given conference presentations both in the United States and abroad. Her pioneering teacher training program, Embodiment in Education, is now in its tenth year. Bauer served on the board of directors of the International Somatic Movement Education and Therapy Association (ISMETA) from 2012 to 2015. She is also a Registered Somatic Movement Educator and Therapist with a private practice in the San Francisco Bay Area. Bauer holds an MFA in dance from the Department of World Arts and Cultures at the University of California, Los Angeles, and is a contributor to the anthologies Embodied Lives and Dance, Somatics, and Spiritualities. For more information please visit susanbauer.com.